Austerities or Vrutham starts on Vrichikam 1 (aprox. November 15) which enables one to observe nearly 60 days of Vrutham before Makara Sankranti (aprox. 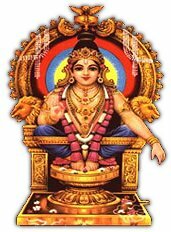 January 14) which is the most auspicious day at Sabarimala. This also helps devotees to observe a vrutham of 41 days before the Mandala Pooja. The devotees initiate the vrutham by wearing a Thulasimala or Rudrakshamala with mudra (mudra means the locket, in this case that of Lord Ayyappa). The mala (bead garland to which is attached a pendant of Lord Ayyappa)) is sanctified in a temple or in the pooja room before being worn. After the prayers, the devotee receives the mala from the temple from the temple priest or a Periya Swami or a Guru Swami. It is also permissible to wear this mala in your own pooja room. At the time of adorning the mala, the pilgrim should be made to understand the implications of the vrutham and the pilgrimage. Before accepting the mala, traditional dakshina (tribute to the Guru) is offered to the priest or Guru. After wearing the `mala', the pilgrim is addressed as `Ayyappan' till his mala is removed on completion of his pilgrimage. Eligible female pilgrims are addressed as Malikapurams. Guruswamy is one who has undertaken 18 or more pilgrimages and climbed the Pathinettam Padi eighteen times. It must be remembered that in the old days, pilgrimage was undertaken once a year only. Eighteen pilgrimages meant 18 years of steady devotion and dedication. On the eighteenth visit, it was symbolic to take along a coconut sapling to be planted at Sannidhanam. Nowadays eighteen pilgrimages can be undertaken in just over a year. So we must re-define Guruswamy to say that it is someone who has undertaken the pilgrimage at least eighteen times, is a total devotee of Lord Ayyappa, and is learned and responsible enough to to convey the full significance of the pilgrimage to his followers. He should also be able to lead his group safely through the pilgrimage. Simple living, absolute cleanliness and holy thoughts are the mainstay of the vrutham. The mind and body are to be kept impeccably pure and absolute celibacy is practiced. The devotee is expected to behave in an austere and sober fashion during his vrutham. Total abstinence from all vices like alcohol, tobacco and non-vegetarian food is stipulated. Personal adornments, hair cutting, shaving, etc. are also taboo. Devotee is expected wear black/blue/saffron clothes. Devotee is expected to pray daily in the mornings and evenings after taking bath. The prayer ritual can be performed by going to any temple or in one's own pooja room. Those devotees who are desirous of worshipping Lord Ayyappa on `Makara Vilakku' day (January 14) may continue their vrutham till that day. The vrutham continues till the pilgrim returns from his pilgrimage to Sabarimala and removes his `mala' after breaking a coconut and offering prayers. 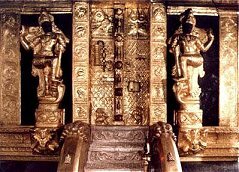 Without a proper Vrutham it is a sacrilege to visit the temple or climb the Holy 18 Steps. (The 18 Steps cannot be climbed if you are not carrying an `Irumudi Kettu'). A vrutham of at least 41 days must be undertaken so that necessary physical fitness and mental conditioning are achieved before the arduous trek. No pilgrim, except the Royal Family of Pandalam, is permitted to ascend the `Pathinettam Padi' without carrying a Irumudi on the head. Those without Irumudis can only enter the temple precincts through the side entrance. Prior to leaving home for Sabarimala, the Irumudi is filled at the temple or in ones own pooja room. The ceremony is conducted with the assistance of the periaswamy amidst chanting of 'Saranam Ayyappa'. Irumudi is carried on the head with due reverence. Irumudi Kettu is divided into two parts. The front pouch and the rear pouch. The front pouch, for identification, is marked with the symbol `OM'. The front portion is meant for stocking pooja articles such as coconuts filled with cow ghee, camphor, unboiled rice, plantain (kadali), aval (flattened rice), pori, sandal paste incense sticks, vibhuti (sacred ash), kumkum (vermilion), turmeric powder, jaggery, kalkkandom (candied sugar)and coins for dakshina. The rear pouch of the Irumudi Kettu contains consumable edible items which are used by the pilgrim for his personal sustenance during the journey to Sabarimala and back. Minimal bedding like blankets or bed sheets can also be carried. These can be used as a cushion on the head. When the pilgrims leaves his home for Sabarimala, he breaks a coconut on a stone near his door step. A lit oil lamp is generally placed on this stone. Till the pilgrim returns home after the pilgrimage, one of the family members ritually lights this lamp at dusk, and allows it to remain lit for a couple of hours, in a gesture of prayer for the well being of the pilgrim and his safe return. When the pilgrim returns home, he breaks a coconut at the same spot to signify the end of the pilgrimage and then moves on to the pooja room to unload the `Irumudi and remove the mala which he had worn at the time of beginning the austerities. That signifies the last ritual of the pilgrimage.